﻿ Licking County Historic Jail - Ohio. Find It Here. Licking County Historic Jail, built in 1889, is Licking County's fourth jail. When it was constructed, the jail was lauded as the best and sturdiest jail the state had ever seen. Its stone, Millersburg brownstone, was quarried and transported from Millersburg, Ohio. 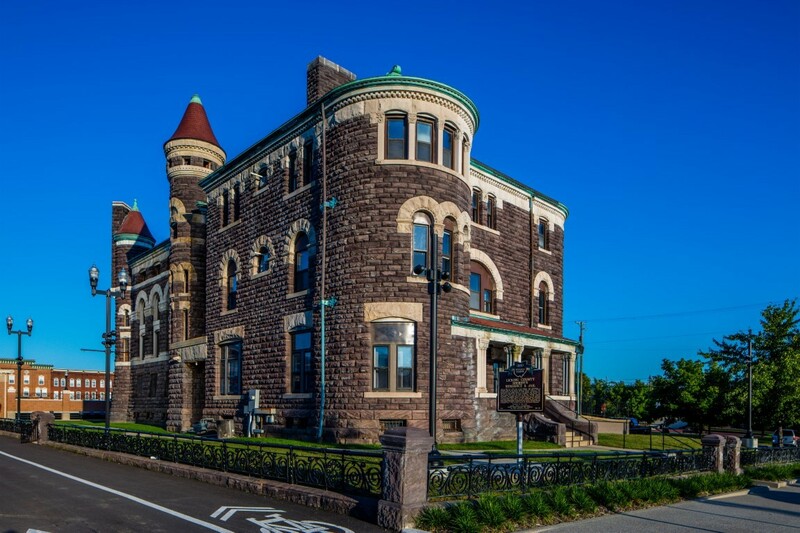 Well known Ohio architect Joseph Warren Yost designed the structure in the Richardson Romanesque style. J.W. Yost is responsible for buildings such as Orton Hall on the Ohio State University Campus, as well as numerous local government buildings. Yost included several unique architectural details in the design, such as cat-like creatures sculpted into window sills and an open mouthed frog water spout. The building has many other features that are typical of Richardson Romanesque architecture, such as arches and turrets. Overall, it is one of Licking County's most architecturally significant buildings.